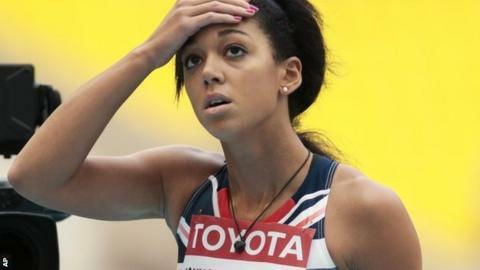 Katarina Johnson-Thompson will have to rely on a wildcard if she is to take part in the pentathlon at next month's World Indoor Championships after illness forced her out of qualifying. The 21-year-old Briton said she was "devastated" to withdraw from Sunday's qualifying in the Netherlands. She has already met the long jump and high jump qualification marks for the championships, in Poland from 7 March. "All my indoor season was leading up to this. I was ready," she tweeted. "Athletics is so up and down. Just not meant to be this weekend." Last week Johnson-Thompson set personal bests in the long jump and high jump at the British Athletics Indoor Championships in Sheffield, hitting qualifying marks for Sopot in the process, meaning she could be selected for the individual events by Team GB. But after competing over 60m hurdles in Apeldoorn on Sunday she withdrew from the final four events of the pentathlon, which is the indoor version of the heptathlon, with five disciplines rather than seven. The International Association of Athletics Federations (IAAF) invites eight athletes to the combined events competitions at the World Indoors. Only one wildcard place is on offer, with the winner of last year's Combined Events Challenge, the top three athletes outdoors from last year and the top three indoors from this season qualifying by right.